February 11 marks the anniversary of the Iranian Revolution of 1979, a jolting socio-political and geopolitical event that transformed the dynamics of the Middle East, energy security, and global diplomacy. Iran, at the time a key regional ally of the U.S. and the West, became a virulently anti-U.S. and anti-Western state with a state ideology rooted in Shiite Islam and perceived principles of Iranian exceptionalism. Over the next three decades following the revolution, Iran became an international outcast and found itself a target of seemingly never-ending international sanctions, a military attack by a major Arab army, and international attempts to contain and curb its religious ideology. The country pursued a foreign policy that is regarded by many as adventurous, and independent by others. Iran opposed America’s leadership role in the region and denied Israel the right to exist. It entered into a fierce ideological rivalry with Turkey and undermined Arab monarchies of the Persian Gulf region. Today, Iran is in the midst of what appears to be a major recalculation of its strategic regional and foreign policy imperatives as it tries to mend fences with the United States and drag itself out of paralyzing economic sanctions and re-enter the global economy. 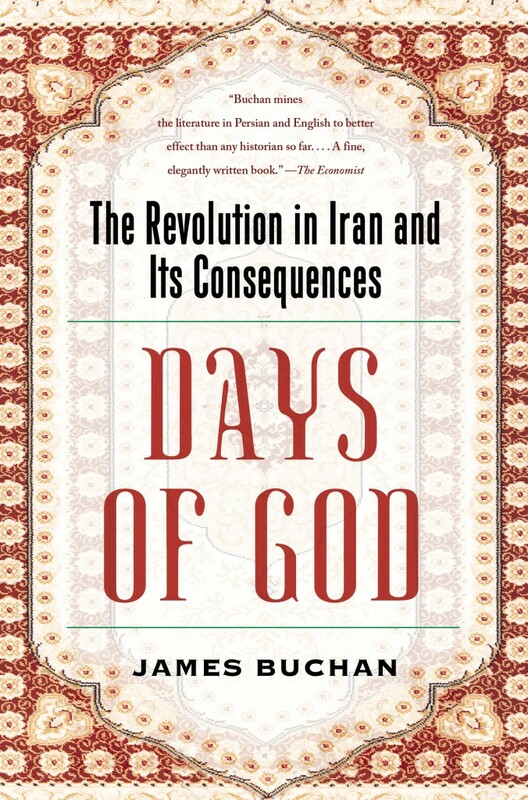 On the occasion of the anniversary of the Iranian Revolution, Foreign Policy Concepts spoke with James Buchan, author of the acclaimed book Days of God: The Revolution in Iran and its Consequences to discuss his book and different aspects of Iranian political life and culture. James Buchan studied Persian at Oxford University and first visited Iran in 1974. A student of Arabic as well as Persian, he was for many years a correspondent for the Financial Times in the Middle East, and later in central Europe and the United Sates. He has written more than a dozen works of fiction and history, several of which have won prizes in Britain and have been translated into fifteen languages. Mr. Buchan lives on a small farm in Norfolk, England. One of the questions that continues to baffle many Iran observers both inside and outside of Iran is how could a regime under years of international sanctions, a nearly decade-long devastating war with a major Arab army, and embroiled in breathtaking levels of economic mismanagement and inequality could survive and still rule with a repressive hand. What factors do you think the Islamic Republic owes its longevity to? An institution can outlive its strength. In the case of Iran, both the Safavid dynasty (1501-1722) and the Qajars (1796-1925) persisted in power long after they had exhausted their vigor and their treasure. Actually, the Islamic Republic has some strengths that, while not evident to strangers, none the less have preserved clerical government for more than thirty years. Second, the framers of the constitution of the Islamic Republic, bless them, installed in 1979 so many checks and balances that no faction can prevail. The ruling class exhausts itself in squabbles in an array of superfluous institutions. Meanwhile, the popular franchise delivers regular electoral shocks, notably in the presidential elections of 1997, 2009 and 2013, that give an impression of movement and change. Third, the Islamic Republic, like the monarchy in its final years, makes few demands on the public. Iranians will tolerate their governments but under no circumstances will they pay for them. The Islamic Republic lives not from taxation but from sales of crude oil abroad and, when those fail, as they have failed in the last eighteen months, the regime changes direction. Fourth, and most important, no Iranian wishes to go through another revolution. What do you see as Mossadeq’s key legacy in the Iranian political culture and in the way Iran interacts with world powers today? Mohammed Mossadeq, a two-time prime minister in the 1950s, was an attractive individual, perhaps the last true Iranian of the old school. He expelled from Iran the British oil company (forerunner of BP) which had managed Iran’s oil fields since World War One for the benefit of a cartellized world industry and the British Treasury. He was driven from power in 1953 and imprisoned. The additional oil revenue that became available to Iran financed the Pahlavi autocracy, which he despised, and the Islamic Republic, which would have made him laugh. For sentimental Iranians, Mossadeq is the great what-have-been of modern Iranian history. They are convinced, against the historical evidence, that Mossadeq was removed by British and American secret agents. In reality, Mossadeq was both obstinate and indecisive, and was outmanoeuvred by the Court, the royalist clergy, the officer corps and the south Tehran crowd, which was then royalist. None the less, a great many Iranians cling to the ancient prejudice that foreign meddling is the source of all Iranian ills. That prejudice is of great value to the Islamic Republic. Three and a half decades after the revolution, where are the key struggles taking place in the Iranian society? What is your assessment of the current tensions between forces of modernity and those of religiosity in Iran? The principal characteristic of the Islamic Republic is waste: waste of time, waste of money, waste of lives. Forty years on, per-capita GDP (in constant dollars) is no higher than under Mohammed Reza Pahlavi in the 1970s. In the two presidential terms of Mahmoud Ahmadinejad, between 2005 and 2013, Iran earned $500 billion dollars from oil exports but ended up doling out potatoes to the poor. The nuclear program – frivolous, half-hearted and extravagant in money – was what Iranians call tof-e sar bala or, as we would say, a shot in the foot. The doubling of the Iranian population in the 1980s and 1990s gave Iran a host of young men and women who have found no employment. When I first travelled to Iran in 1974, to pass from eastern Turkey to Iran was to go from the Third World into what was almost a developed country. That condition is now reversed. The capital struggle in Iran now is between those, principally but not all young people, who want Iran to join the main stream of a prosperous and communicative world and those, principally but not all of middle age, who want her to stay poor and virtuous. Iranians are so unworldly that one should not bet on the outcome. Days of God: The Revolution in Iran and Its Consequences. Simon and Schuster, 2013, 432 pp. Did the Shah and his inner circle believe that the Iranian society was ready to embrace modernity? What did they not see about the social fabric of the Iranian society? Reza Shah Pahlavi (1925-41), the father, and Mohammed Reza Shah Pahlavi (1941-79), the son, were very different men but both believed that Iranians must be forced to become modern. Only thus, they reasoned, could Iran withstand the foreign powers, principally Russia and the British Empire but later on also the major oil companies and the Arab nationalists, such as Abdul Nasser. Unlike the Islamic Republic, which demands that all Iranians think alike, neither man cared a fig what Iranians thought as long as they did not get in the way. Both felt that the Iranian public would, in the end, be grateful to them, which showed a misunderstanding of human, not just Iranian, nature. The Pahlavis failed or refused to see that in creating a standing army and public administration, roads, ports and industries, public education for boys and girls, clubs and institutes, they were breeding a middle class that would require a voice in public affairs. They did not notice that the Shia clergy in Iran, which had pretensions to rule going back to the Safavids, was reacting to the growing power of the throne, and was itself becoming modern, well-organized, rich, mean, clever. We have Khomeini’s writings going back to the close of World War II, and it is notable how his political thought, at first so rustic, develops under the influence of leftist and Third Worldist ideologies. In your book you write about land reforms that displaced millions of rural Iranians who changed the social stratification of Iran’s big cities. How did the newly urbanized rural class, who were among participants in the revolution, gradually rise in post-revolutionary Iran to become the country’s ruling class? The migration to the cities, which began in World War II and accelerated in the prosperous 1950s and 1960s, has continued unabated to the present day. I doubt that the Shah’s agricultural policies much altered this trend, which is anyway evident all over the world. As far as I can tell, the rural migrants in the cities did not play a great role in the revolution until the great demonstrations in favor of Khomeini and an Islamic Republic in Tehran in December 1978. At the time, I noted a change in atmosphere and a messianic tone that arose, I thought, in the nature and traditions of those new townspeople. It was as if they believed that the Prophet was intervening in the affairs of his favorite nation through the person of his descendant, Mr. Khomeini. In the early years of the Islamic Republic, where piety counted for more than experience or competence, some of these people rose in the public administration and the Corps of Guards filled the positions abandoned by the half-million or so emigrants of the war years. Many of them consider the Islamic Republic to be theirs. Yet even they have been frustrated by the maladministration of the last ten years. Is it fair to suggest that the Islamic Republic has brought about a situation today in which Iranians have begun to see value in moving toward the separation of church and state? How could this process be unfolding in your opinion? It may be that church abandons state, rather than the other way round. In the debates over the constitution of the Islamic Republic in the summer and fall of 1979, a parliamentary constitution (largely based on the French Fifth Republic) was bent and twisted to accommodate the person of Mr. Khomeini. His death in 1989 left the constitution in tatters. His successor, Mr. Khamenei, lacks his authority or rather derives what authority he has from his association from the 1950s onwards with Mr. Khomeini. Meanwhile, the seminary or senior scholars in Qom, who admitted Mr. Khomeini into their number only with reluctance in the early 1960s, have drifted away from the Islamic Republic. That is for two reasons. First, Mr. Khomeini’s doctrine of clerical dictatorship was largely of his own invention, divided the seminary at the time of the revolution and has not found adherents among the Shia outside Iran, not even in Iraq. Second, many in the seminary feel that the Islamic Republic has brought religion into disrepute. None of us lives for ever, and I wonder how the Islamic Republic will find a successor to Mr. Khamenei who possesses both wide religious authority and the correct political attitudes. Would President Rouhani’s success in defusing the nuclear crisis strengthen his hand in opening up the domestic politics and help him move Iran toward a more moderate, if not liberal, polity? Mr. Rouhani has a fund of political credit that rests on his landslide victory in the presidential election of June, 2013 and the embarrassing memory of Mr Ahmadinejad. For the moment, he needs to concentrate on breaking the nuclear deadlock so that Iran can at last export some oil lest it be left in the ground. Should he succeed – and he is doing well — he will face the dilemma that confronted Mr Gorbachev in the 1980s. How was Mr. Gorbachev to open a bankrupt Russia to the world while preserving the central role of the Communist Party of the Soviet Union? How do Rouhani and his friends bring Iran back into the world while preserving clerical government? It will be interesting to watch. We should, none the less, remember that Mr. Khatami, elected in a similar landslide in 1997, soon disappointed his supporters in the universities and reformist circles. How do you assess the impact of the generational shift in Iran on altering the institution of clergy in general, and on the Shiite concept of state in particular? Iran, like all countries in the world, is becoming less religious. Most Iranians were born after the war with Iraq and never saw Mr Khomeini even at a distance. The blood of the martyrs means nothing to them. The legends of the Revolution, devised for a half-illiterate population and peopled by heroes and demons, are an embarrassment to educated young Iranians. The regime’s anti-colonial ideology is outdated in the age of China and the Brics. However, Shia theology and jurisprudence are dynamic and can adjust to all manner of external alterations and shocks. The alienation of the seminary from the Islamic Republic that I mentioned earlier is just one aspect of that process: an act of self-preservation should the Islamic Republic, God forbid, come to grief.